SRK Birthday Bollywood superstar Shahrukh Khan celebrates his 45th birthday here on November 2. There have been lots of prayers and slogans for Shahrukh Khan by the fans on the eve of his birthday. 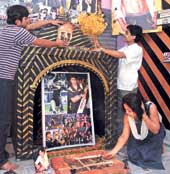 Arnab Roy, secretary of the 12-year-old Shah Rukh Khan Fan Club along with other memebrs have built a thermocol and plywood shrine for Shahrukh Khan in Rajarhat. We made meetings with our fans every Sunday to plan this. On one week we had worked for this 6ft by 4ft temple exclusively for Shahrukh Khan created by pandal artisans from Girish Park. It was their gift to SRK and the puja is for his continued reign at the top said Roy. Sourav Ganguly who celebrated his daughter's birthday yesterday is expected to meet him by person to wish for his birthday and success in the future. In 2008, Newsweek named him one of the 50 most powerful people in the world. 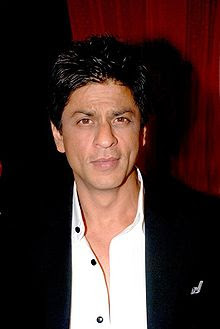 Shahrukh Khan has won thirteen Filmfare Awards, seven of them which are in the Best Actor category. Surely Shahrukh Khan would want to forget the recent failures in the bollywood industry and start afresh this birthday. Shah Rukh was born in 1965 and thus was 44 last Monday, not 45. All SRK fans know this!